Not only needed but oh! so enjoyed!!! The Friday Night Sew In is a wonderful thing. Sometimes we get so busy that we forget to give ourselves permission to play. Sometimes we get so busy that we need a FUN thing to look forward to so we can get through the busyness! Both applied to my past week! Thank you, Sugarlane Designs! Ta! Da! My star (middle of bottom row) was paper-pieced and then there were about six more seams (and don't forget pressing!) sewn and my middle is done! 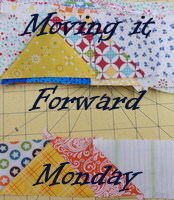 There are four paper-pieced cornerstones and outer borders to be done and I can call this one a keeper! For those of you keeping up with my mother, her basement was 80% complete yesterday. The boys will be back today to finish up. I've got a sewing day planned today so I asked my husband to assist Mom and get all the final instructions on how to take care of her new basement equipment! Thank you, honey! Good morning! I thought I'd squeeze this post in while I had a moment or two. This morning I'll be heading over to Highland for Tips & Techniques. This "class" is held on the 2nd Thursday of every month at Rosemary's Fabrics. It is so fun and I always look forward to seeing my friends and Show-n-Tell. Between Rosemary's talk and the class projects, it's always inspirational! But the main reason I'm posting today is to let you know that tonight is FRIDAY.NIGHT.SEW.IN!!!! I'm so happy because it couldn't have come at a better time. This week has been (and will continue today & tomorrow) packed to the max with stuff to do. Two of the days have been filled in with my mother ... I try to get down to her house on Wednesdays to mow her lawn and do miscellaneous chores for her. On top of that we've been waiting our turn for her basement to get a re-do so it never leaks again and Friday is that day. What a job, though, that has been prepping it. You see, she has been in that house almost 50 years and the basement? Yowsa! We had to get everything moved out from the walls 4 feet. On top of that, a few years ago she had a mouse infestation so you can understand the problem, right? So anyway that was 2 of my days this week but wait! There's more!!! However I won't bore you with those details. Suffice it to say that I have been so busy that I actually DESERVE FNSI!!!! You can find out all the information by clicking the button below. You should do this and join me & the rest of the gals!!! We all probably deserve an uninterrupted evening of sewing! I've been busy getting all the blocks trimmed to size and I started assembling the blocks. In order to complete the assembly, I've got a star block to paper piece and it goes right there on the bottom row in the center. See the open space? After that there's corner stones and borders to figure out! Yup, right on schedule for a potential finished top by the end of the month! YIPPEE!!!! Friday night cannot get here fast enough!!! See you Saturday with my project update! Next project has to use 2 different colors of yarn -- one solid/tonal and one multi-colored, which is actually the leftover Lorna's Laces Yarn from Kelli's Cowl. Thrifty, you say? Yay, I say! Anyway, I'm making a pair of Houdini Socks. 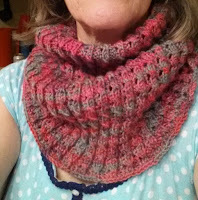 The pattern was designed by Cat Bordhi and it has been super fun! You start out knitting the sole and instep together. Then you actually cut the yarn where the leg begins! I know! Sounds weird, huh? I was so nervous when it came to the cutting but it worked beautifully!! I may do this technique on all my upcoming socks! 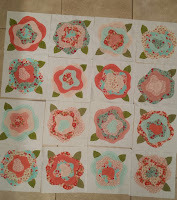 16 Vintage Roses Blocks DONE! 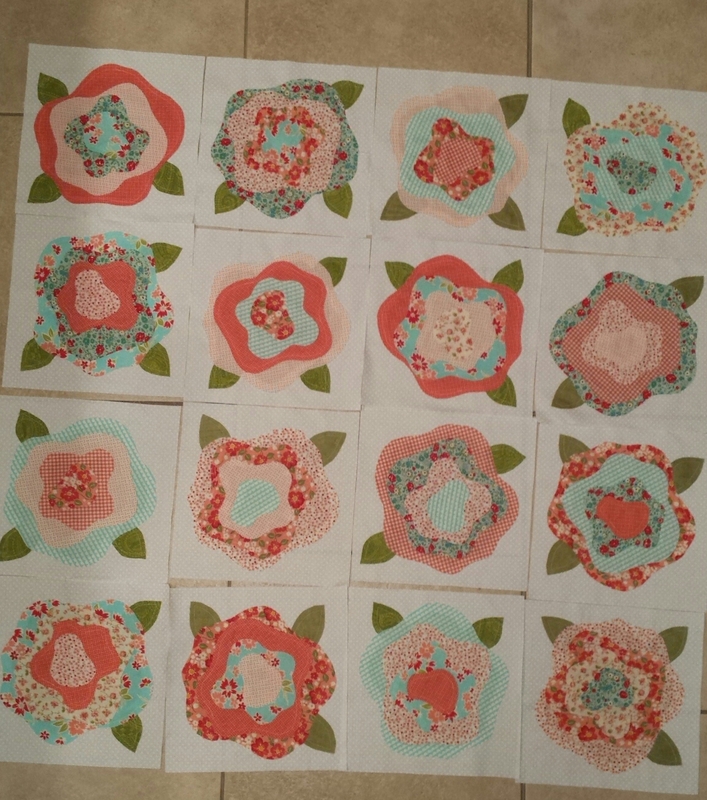 I'm happy with the progress I made on my Vintage Roses. It was the chosen project by the 2016 UFO Challenge. 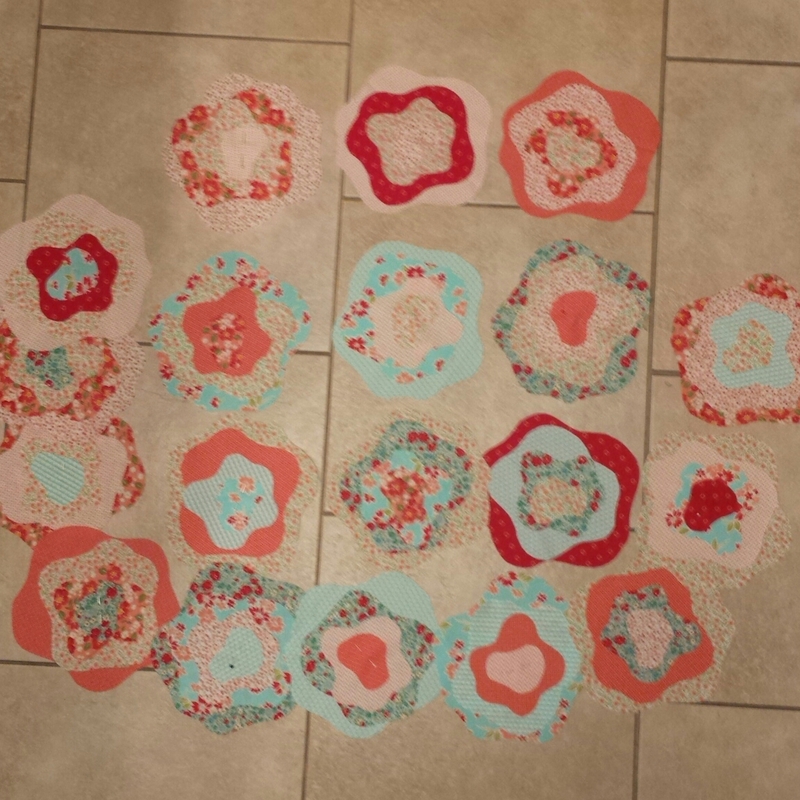 I unsewed the three blocks made in class and actually finished 16 blocks! Hurray for me! I must confess though that it wasn't too difficult since I managed to escape on retreat! 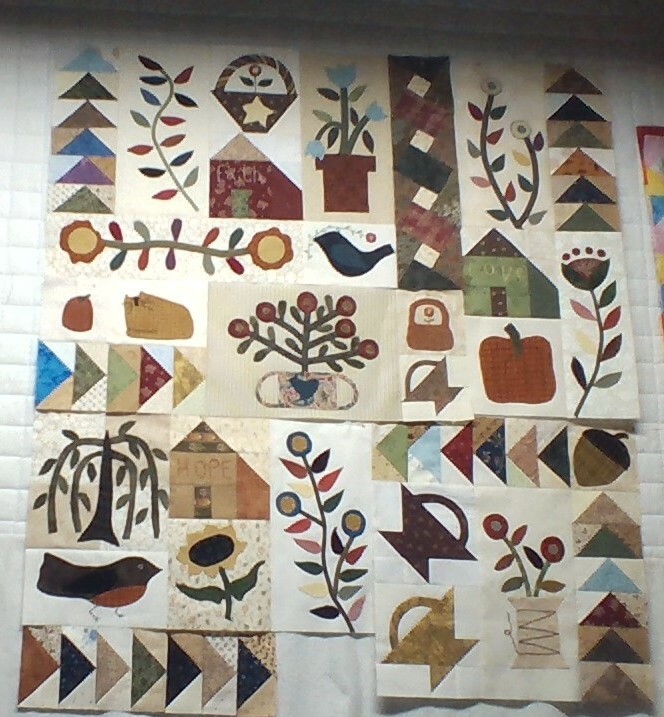 While being pampered at Sprague's Kinderhook Lodge, I also worked on my guild's Block- of-the-Month. No picture yet as it will be shown at next guild meeting. But suffice it to say that I managed to finish the top because I continued work on it after returning home! 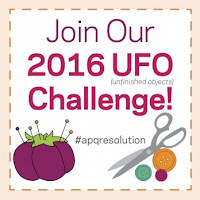 The 2016 UFO Challenge has picked #1 for the April project to work on. From my original blog post, here is a picture from my design wall of my starting point. 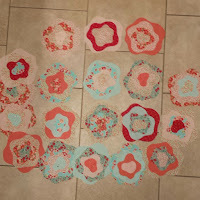 There are a couple more blocks to sew and a few more flying geese to complete and then assembly! Can't wait to get going on this one again! I loved doing all the blocks to this one so far and it really, really, REALLY needs to get finished! Challenge on!!! Have a creative weekend and I'll catch you later!